It's one of the things that every writer does, after all we can't just refer to our characters as "the black haired one who has no name". I'll admit at times I have looked through Google for top names to call children and there was a Tumblr post going round the writing community that said something like "I'm Not Pregnant, Just Naming Characters" in response to a fictional book called "I'm Not A Psychopath, Just A Writer". I've done it, you'll do it, the majority of us will do it during our time as writers. You have to call your character *something* after all! The problem is that sometimes we already know what they'll be called - like when I named Tara after my pet rat - and other times it doesn't really matter or we're not looking for a meaningful name, just a name will do. However, and having done this myself, sometimes we need a certain name. One that has great meaning and will lead the reader to look up the etymology of the name and think "ah ha! *That* is why he/she is called that!" and we'll be rather pleased with ourselves. That's where baby name sites and books of names come in handy. You can also call them after a friend, a cameo in your book if you will. I have a lovely t-shirt that says "do not annoy the writer. She may put you in her book and kill you" and I think it's very true. I have used people I know to mould and create characters. I have also just used their personality traits or their name and the character is nothing like them and I mean for that to happen. I haven't, as of yet, put someone in a book just to kill them because they annoyed me, but give me time and I'm sure it'll happen. So, how do you choose? I'm quite fond of the open a page and stick a pin in it method. I've done that with maps of the UK when I'm deciding where whoever it is should live. Only a few times mind you, the majority of my books take place in the same town. Totally unnamed and there's no need for me to even do that. At least not yet. As those who have read LYNNE & HOPE will know, Tally & Lisa from BLACKOUT make a very short appearance and so that may have told me readers that they all live in the same place. They don't interact with each other (at least not in any other books I've written to date) but it's a town where I picture them all co-existing. The exceptions to that are book seven, which is based in two separate places and book nine which is based in my home town. Whatever, I'm getting off the point here. How do you decide if the name for your character is the right one? Have you ever noticed that some people really "fit" the name they use? I mean like I've known some Daniel's that really suit that name. I've known others, like Simon and such. What you should aim for is that the character suits their name. You can be all fancy, you can be all I don't care, give me a name that starts with z and go from there. However, you want it to be a name that's fitting to who they are. You don't have to go with a common name, though going too uncommon leads to confusion at times. I know I'm guilty of that - Kaolin isn't exactly on the Top 10 Names list...ever actually. I, however, purposefully picked her name to be obscure. 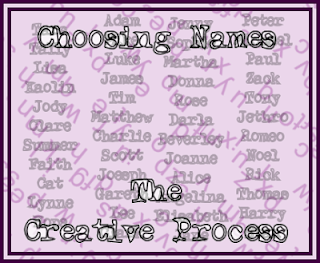 I have my reasons for the majority of my names and I could list them all here, but it's not about me naming my characters, but about you naming yours. The thing is, generally speaking, you don't just have to find *one* name, but two because you have to have a surname (or at least you have to have one in the books I've written) and that's where something like Google comes in handy. In a few of my books, I've had characters from different countries appear - Thank God for the Internet - and because I don't want to necessarily use a friend's surname, I can easily Google "common surnames in Finland/Nigeria/Iraq etc" and I usually get what I'm looking for. I do the same for first names when I want it to be a name not readily used in the UK. You can, of course, do the same for someone's surname when they are from the UK. However, I've found that for all the minor characters you will write, they don't list enough surnames for you to have a unique one every time. And it doesn't have to be unique every single time you make a new character. After all they are the "common" surnames which kinda suggests that more than one family in the UK have that surname. I try to avoid it if I can, or I just make one up. That's the good thing about creating characters and names and stuff, because sometimes you can pull something out of your arse and no one can tell you it's wrong. If it works for you, do it. As long as it's not something completely stupid like Bob nosurnamecozicouldntthinkofone, then I think you'll do okay. So, go forth and create characters, mould them (found here) and name them. Then go and send them on adventures, because that's what they live for. Follow Joey on Facebook or here on her blog to be kept up to date with the latest news about Joey and her books.